07 January 2019 (Toronto, ON) - Island Records, Interscope and Universal Music Canada, the country’s leading music company, today announce new vinyl reissues from U2. Remastered and pressed on 180g double LP black vinyl, plus limited edition 180g double LP ultra-clear vinyl, No Line On The Horizon (2009) will be released on February 22 (available to pre order from January 9). Recorded between Fez in Morocco, Dublin (HQ), New York (Platinum Sound Recording Studios) and London (Olympic Studios) and produced by Brian Eno, Daniel Lanois and Steve Lillywhite, No Line On The Horizon debuted at #1 in 30 countries across the globe on release in 2009. The lead single “Get On Your Boots” was followed by “Magnificent” and “I’ll Go Crazy If I Don’t Go Crazy Tonight”. 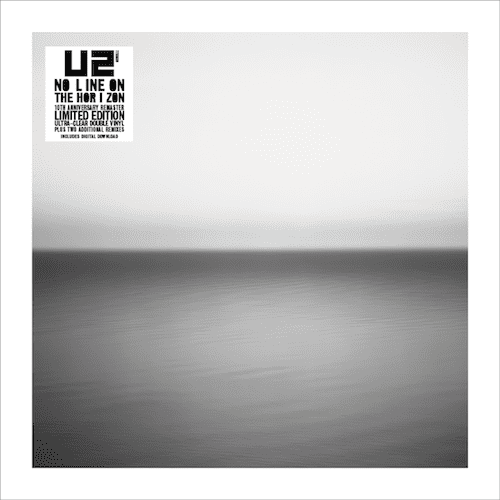 The 12th studio album from U2, No Line On The Horizon has been fully remastered and the reissue will also include two additional remixes to celebrate its 10th anniversary – “Magnificent (Wonderland Remix)” by Pete Tong and Paul Rogers and “I’ll Go Crazy if I Don’t Go Crazy Tonight” (Redanka’s ‘Kick the Darkness’ Vocal Version). Artwork faithfully reproduced from the original, including a gatefold sleeve, 16-page booklet, printed inner sleeves and heavyweight outer plastic sleeve. Vinyl reissue includes a download card for digital access to all 13 tracks (11 album tracks plus 2 additional mixes).